The tactic of pinning discounts to calendar events in order to drive up sales is a long established technique - and it continues to send profits soaring on the net despite the 24/7 hour nature of online retail. Electronic retail industry body Experian and IMRG have predicted an online spend of £748m ($1.1bn) by UK shoppers alone on 26 December, the day after Christmas when shops traditionally slash prices. That follows an estimated £636m ($994m) shopping spree on the net on Christmas Day itself, said Experian. So if you're still wearing your festive onesie, and you're in the mood for some serious bargain hunting without leaving the house, don't despair if you find your dream discounts have already sold out - you're probably not far away from the next opportunity to grab a good digital deal. Savvy online retailers are seeing enormous profits from both introducing events established in one country to another - or completely manufacturing their own. Black Friday - traditionally the Friday following the US public holiday Thanksgiving - has been a major retail event since the early 2000s. The term itself dates back to the 1960s when it was used by police in Philadelphia to describe heavy traffic on the roads as people returned home from family gatherings. But in the last four years it has also evolved into a diary date for big spending in the UK, despite the fact that Thanksgiving has never been a recognised holiday for the British. This year Amazon recorded its most successful day ever in Britain, with 5.5m orders - averaging 64 per second during peak times - on November 28, aka Black Friday 2014. Even some of the major retailers struggled to handle the online frenzy with John Lewis, Tesco and Argos websites experiencing technical problems and customers joining virtual queues of up to an hour just to browse the virtual shelves on the website of electrical goods seller Currys. "The US phenomenon of Black Friday is now firmly embedded in the UK e-retail calendar," said Tina Spooner, chief of information at retail analyst IMRG. "While the first two weeks of December are traditionally the peak festive trading weeks for the online retail industry, Black Friday now marks the start of the online shopping season [in the UK]." Meanwhile Chinese retail giant Alibaba has reaped the benefits of putting its weight behind the Singles Day sale - a celebration originally created by some university students in the early 1990s for Chinese people not in relationships - in 2009. This year it shipped a record 278m orders - worth $9.3bn (£5.9bn) on 11 November (11/11) the day itself. Two years ago Alibaba trademarked the term "Double-11", which is a popular nickname for the event in China. 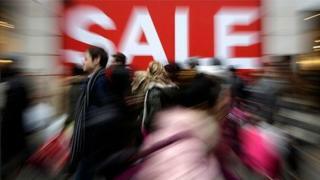 More than 27,000 global brands took part in the sale, which has now officially become the world's largest retail day. "Lots of clients from the brands side have for the first time approached the Singles' Day as an event on its own, and earmarked it as a significant retail operation, as major as Christmas and the Chinese New Year," Shaun Rein from China Market Research in Shanghai, told the BBC. One diary date that might prove a little more difficult to globalise is nonetheless a fascinating example of monetising local cultural consumer demand. Relatives living abroad and unable to attend have traditionally sent home money at this time (a generous total of $1.3 billion (£0.8bn) was dispatched to Senegal for Tabaski in 2010) - so last year a local start up called Niokobok began accepting orders from overseas for live rams, with buyers receiving a picture of their family receiving their four-legged gift as part of the deal. Within Senegal itself "online retail is only just beginning", Niokobok chief executive Laurent Liautaud told the BBC, but this year the firm received 1,000 orders from ex-pats. "We... see it's people thinking about their relatives, and wanting to make them happy, so they want to send a gift," he said. "Rather than public events leading retailers, they could use their own data to drive spending," he said. "[Brands like] Amazon are already using algorithms to predict your behaviour." This might also minimalise the logistical headache faced by firms trying to co-ordinate timely delivery during a seasonal rush - following Black Friday online sales this year Marks and Spencer admitted that its expected delivery times had doubled from five to 10 days. "Some of the big retailers have caught up, and are being clever in integrating online and physical stores," said Mr Collister. "Have we reached the peak of online-only retail? We are seeing the rise of click and collect. The larger brands can compete with low prices online, but you are able to reserve your goods and pick them up. "Shops still have the convenience factor - you don't have to wait in for a delivery."